SF Pride Season is upon us, and so far the week has been glorious. I must say, over the past couple of years, my cynicism about this event has been tempered, by, well, PRIDE — in all of my friends and fellow San Francisco citizens, and all of their brave and beautiful endeavors. 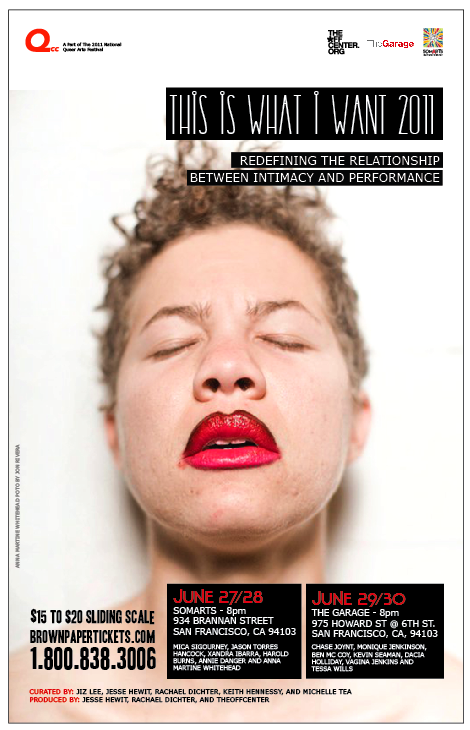 ‘I Want What You Want’ premieres in the Wednesday/Thursday program of this 4 day festival, but I highly recommend attending the Monday/ Tuesday program as well. Tickets here. Shows will sell out! 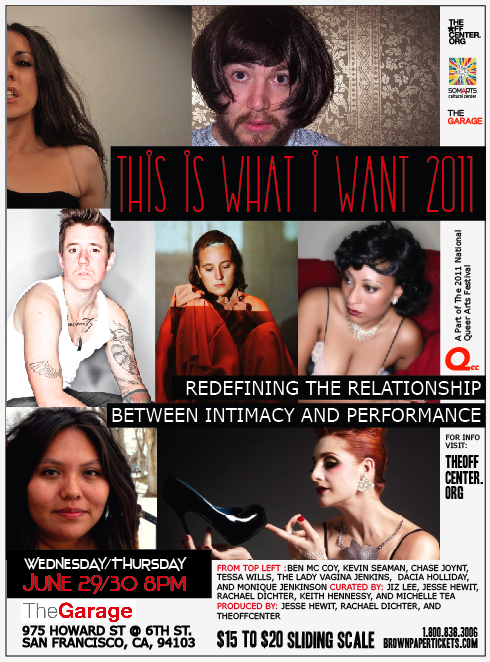 Curated by: Jiz Lee, Jesse Hewit, Rachael Dichter, Keith Hennessy And Michelle Tea, produced by the Offcenter and co-presented with SOMARTS and the The Garage as an official presentation of QCC 2011 National Queer Arts Festival. Read about it in the SF Bay Guardian. Lately, I have had the pleasure of being interviewed by some cool, smart people I respect. Such a luxury. Earlier this Spring, Kegan Marling wrote a truly beautiful piece, with an interview, for In Dance. We talked about artmaking as conversation, site-specificity, and the rigors of lip-synch choreography. Read it here. Then I got to talk to literary powerhouse Michelle Tea, who basically gave me my dream interview for the Radar blog before I performed (along with Keith Hennessy & Cintra Wilson) at the Radar Spectacle. Also, look for Kristin Smith’s upcoming piece in The Bold Italic. And last but not least, save the date for Kate Bush VS Bjork at Trannyshack. How could you miss that?